I always try to buy only 2-3 bananas at a time. Whenever I buy more than that, I inevitably end up with a couple of bananas that sit on my counter until they are too ripe for my tastes. However, this past week, I bought a whole bunch of bananas with every intention of eating them all! Fortunately for the bananas, I intercepted them on the way to their doomed demise. Fortunately for me, I had a box of cake mix that also needed to be used up! I had such success with the pumpkin + water + cake mix recipe, I decided to give bananas a try in lieu of pumpkin! The result? A delicious and moist chocolate banana muffin (or cupcake). These would be even MORE delicious if you added 1 tsp of chocolate chips to each muffin tin! 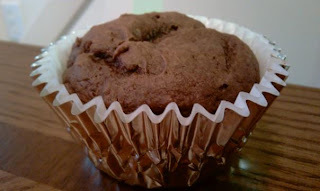 (adds 1 Weight Watchers PointsPlus per muffin). 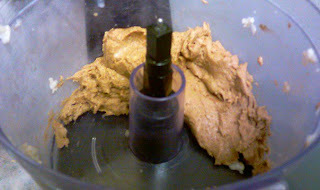 Mash bananas thoroughly or put bananas and water in food processor/blender and blend until smooth. Add cake mix and mix thoroughly. 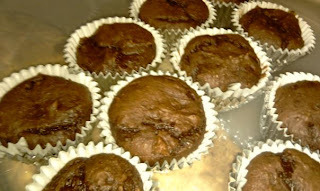 Spoon into lined or greased muffin tins (regular size). 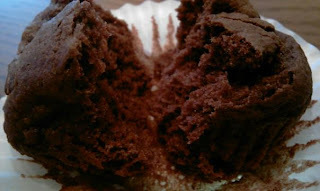 Bake for 18 minutes or until toothpick inserted in the middle of a muffin comes out clean. Remove muffins from the pan and let cool. "Eat The Whole Bowl" Ice Cream! Have you ever taken a look at the nutrition label of your favorite ice cream? Did you notice the serving size? Have you ever measured out 1 serving of that ice cream? If you're on Weight Watchers like I am, then you probably have done all of the above at least once! Sometimes, a half a cup of ice cream just isn't enough! Sometimes, you just want a whole full bowl of the stuff! That's me tonight. 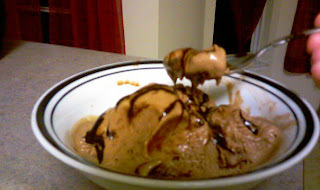 All I want is a big, chock-full bowl of fudgey, peanut buttery ice cream! 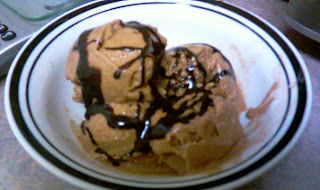 Now, I don't have an ice cream maker. However, I happened to remember an idea from one of my favorite recipe bloggers: Chocolate-Covered Katie's voluminous vanilla ice cream! Now, Katie's recipes all recommend using some creamer or coconut milk to help make the ice cream creamier. 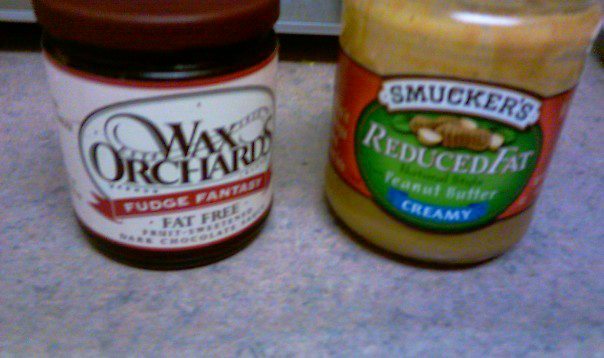 However, since I'm on Weight Watchers, my goal is different -- volume without additional Points Plus! Katie mentions that her ice cream recipes tend to be less rich using just almond milk (my non-dairy milk of choice, but you can use soy milk, coconut milk, or whatever! ); so, I was wondering if there was some way to re-introduce the "creamy" without the Points Plus! PointsPlus per Serving: If you run this through Weight Watcher's recipe builder, the banana and almond milk base = 3 PointsPlus ...and additional points will depend upon your add-ins. 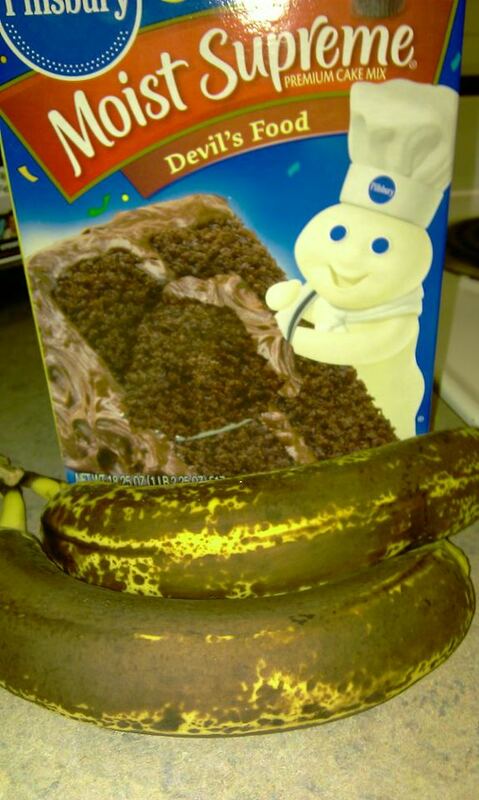 However, if you're like me and do not want to count PointsPlus for the banana (since this is a raw combination of ingredients), then the PointsPlus are determined by ONLY your add-ins. For my add-ins today, it was 3 PointsPlus. Pour your 1/2 cup of almond or other non-dairy milk evenly into the small dishes with some of the banana slices. 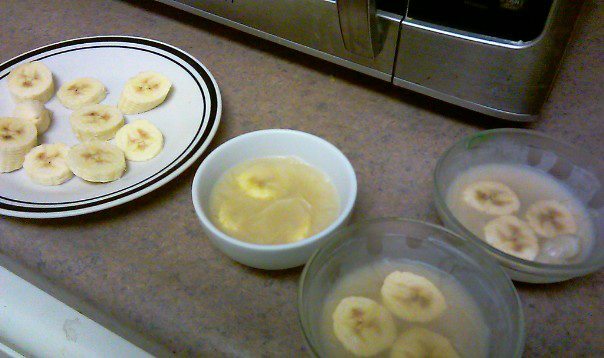 Place the remaining banana slices on a plate. Place all of the banana slices and banana/milk mixture into the freezer and freeze completely through. Remove frozen milk/banana mixture by running the bottom of the containers under hot water until you can pop the frozen portion out. Place all banana slices and milk/banana mixture portions into your food processor (I have not tried this in a regular blender and can't vouch for whether that would work or not). This recipe was pretty much a shot from the hip. I needed to come up with something using only the ingredients in my pantry. So, I had a little "Chopped" competition with myself! I love "Chopped," it's probably one of my favorite shows of all time. For those of you who don't know, "Chopped" is a show on Food Network where contestants get a basket of ingredients and must turn them into a delicious dish. 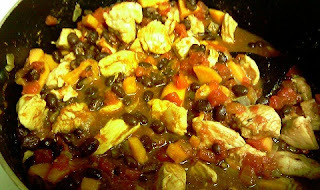 So, in my "Chopped" competition with myself, my ingredients were chicken breast, black beans, sweet potatoes, half an onion, and canned diced tomatoes.... GO! Chop your sweet potato and onion. 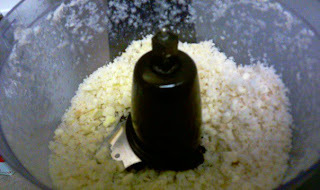 Mince or crush your garlic. Cube chicken breast into even pieces. Spray a non-stick pot with cooking spray. Heat the pan on medium heat. Add the garlic, onion, and sweet potato. 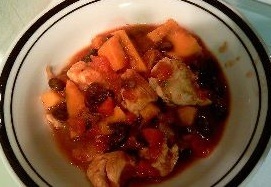 Cook until onion is translucent and sweet potato is tender. Add chicken, salt, and chili powder. Cook until chicken is cooked through. Add tomatoes (with their juice!) and drained/rinsed black beans. Simmer 10 minutes until chili is heated through. Serve with rice (additional points!) or as-is. Sometimes (like possibly in the last uhm...2 months), I just don't have time to cook. Sometimes, I like to eat out. Whether for a celebration or for no particular reason, eating out is always something special. I thought it might be interesting to see and share where we all like to go out to eat. So, I decided to use a mobile app (also works on the computer) called MapHook to create a group where we all can tag and share our favorite restaurants in our respective areas. Basically, what MapHook lets you do is pull up your iPhone wherever you are and create a "hook" for your location. You can include details, reviews, comments, pictures, and even video in your hook. If you go to MapHook's website, http://www.maphook.com/, you can join and then click on the "Groups" icon in the upper right-hand corner. Search for "NutriNosh Official Group" and join my group! Take a look at the hooks I've already shared about some of my favorite restaurants! Tonight I set out to make a low-point soup that I could eat in large quantities (I've just been really craving bulk since the cold temperatures started hitting). I mixed some of my favorite flavors together and came up with this handy little side dish...or full dinner for those of us who consumed approximately 8 points worth of cookies while baking tonight. PointsPlus per Serving: Using Recipe Builder, it's 2 P+ for a 2-cup bowl or 1 P+ for a 1-cup bowl. However, this recipe uses all 0-point ingredients. So, it's up to you how you count that. For those on Simply Filling, this recipe uses all Power Foods! Chop all vegetables (this is the fun part...not). Saute carrots and garlic first until carrots are soft. (I did this slowly while cutting up all the other veggies). 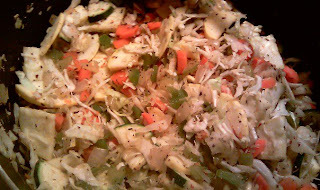 Add onion, celery, green pepper, zucchini, yellow squash, and all spices. Saute until onions are clear. Add cabbage and continue to saute the veggies for about 10 more minutes or until veggies are nearly cooked through. 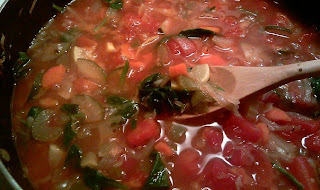 Add diced tomatoes with their juice and the 4 cups of vegetable broth. Reduce heat to low, cover, and let soup simmer for 30 minutes. Uncover and bring soup to a boil. Add spinach. 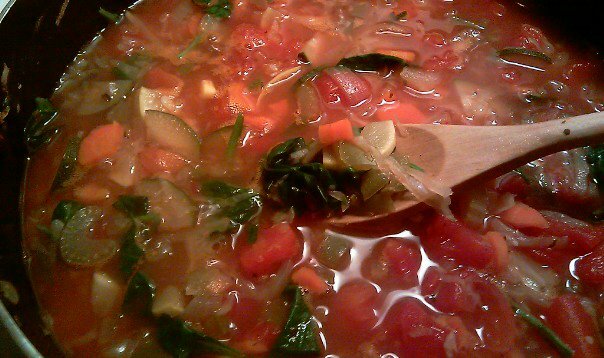 Keep soup boiling until spinach is cooked through. Serve Hot! Or...if you're feeling adventurous...add pasta and top the soup with mozzarella cheese (this will obviously change the PointsPlus value of the recipe). Every Christmas Eve, my entire family gathers at my great grandmother (who, by the way, is a ripe and healthy 97 years old this year). Aunts, uncles, cousins, children of all ages...we all gather, Santa (yes, the real Santa!) comes to hand out gifts, and we indulge in a huge dinner and dessert spread. Christmas happens to be my grandmother's birthday, and every year, either she or my great grandmother brings a red velvet cake as a birthday cake. 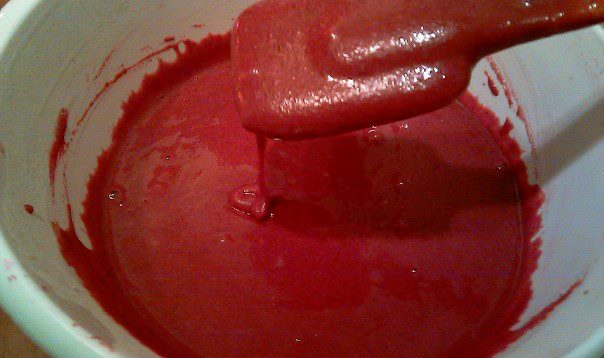 My eldest cousin happens to love red velvet cake, but she is allergic to red food dye, which happens to be perhaps the #1 ingredient in red velvet cake. Despite all of us telling her not to, my cousin generally eats a piece of cake despite her allergies and promptly gets a stomach ache for the rest of the evening. This year, I called the whole family and told them that I would be bringing the red velvet cake...and that it would be completely free of red food dye. That is a pretty hefty promise to make, but I've become sort of the "birthday cake connoisseur" in my family; I have been baking all the birthday cakes recently. 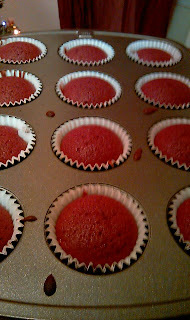 I had been reading up on dye-free red velvet cakes for a couple of months, actually. 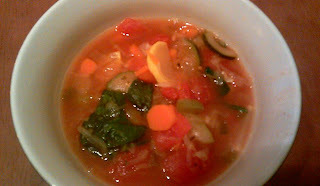 The absolute best recipe I've found (based on all the pH level research) is a recipe on a blog called Sophistimom. Her All-Natural Red Velvet Cake recipe and pictures were perhaps the most convincing I'd seen! (Seriously, gorgeous cake in her pictures...mine won't be that beautiful, I'm afraid.) In any case, while her recipe looks amazing, it is a bit heavier than I was going for (she freely admits that she was going for a very heavy cake). 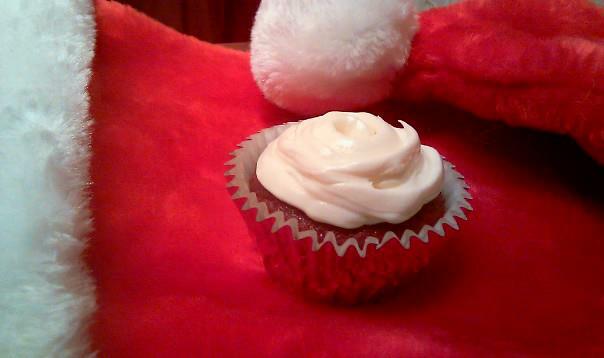 So, I set out to modify the recipe to create a lower-calorie, lower-point, lighter red velvet cake. I decided to create cupcakes on this dry run, though the cake I'll be bringing to Christmas Eve will be a two-layer cake (you can do the same using the same measurements from this recipe). So, I dedicate this recipe to my great grandmother (pictured below), who has been such a huge inspiration to me...especially when it comes to cooking, crocheting, and being a genuine person ;) I love you, Nana! 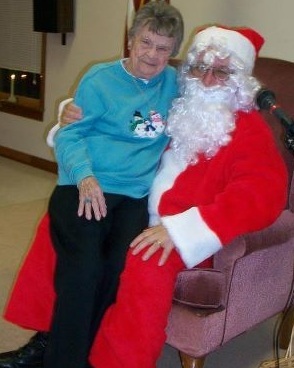 My Nana - 97 years old. NEVER too old for Santa Clause! Note: while I used whipped cream cheese frosting from a can for this recipe, you can, of course, make your own frosting using a different recipe. The cupcakes without frosting are 3 PointsPlus; you will need to calculate the PointsPlus of your own homemade frosting if you choose not to use the pre-made stuff! Peel beets. 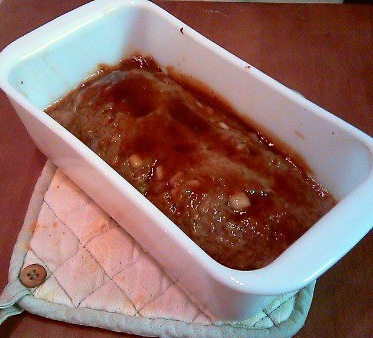 Place in a small baking dish with enough water on the bottom to cover the entire bottom of the baking dish. Cover with parchment paper and tin foil. Bake at 350 for 90 minutes (until beets are very tender). When beets are fully cooked, slice into small pieces and put into food processor or blender. Blend with lemon juice until a smooth puree forms. Measure out 3/4 cups of the puree and put in small dish. In a large mixing bowl, mix oil, buttermilk, and sugar. Add eggs one at a time. 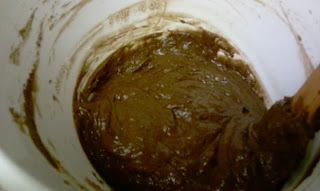 Add chocolate extract (you can use vanilla extract if you can't find chocolate extract). Mix until well-blended. In a smaller bowl, combine flour, baking powder, salt, and cocoa powder. Slowly add dry ingredients into the wet mixture. Mix until smooth. Fold beet puree into the batter. Line a cupcake pan with cupcake liners. Spoon batter into cupcake liners. 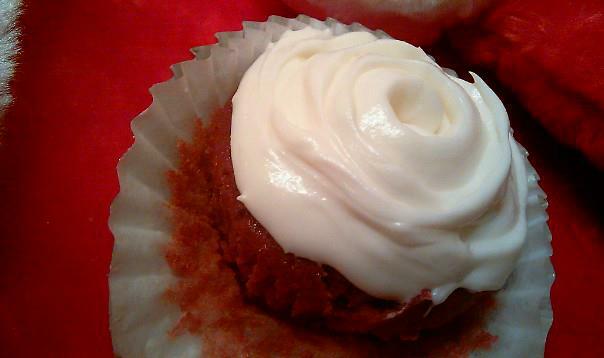 Bake at 350 for 20 minutes or until a toothpick inserted into a cupcake comes out clean. Allow cupcakes to cool before frosting them. Meatloaf brings back loads of childhood memories for me. 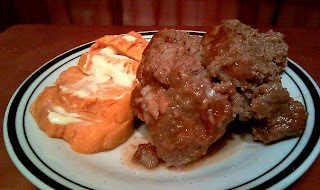 I was not raised in a house where meatloaf meant a sauced-up, overly breaded, flavorless hunks of meat. No...meatloaf meant filling the whole house with the most pleasant aromas of my youth. Tangy, sweet, and mouthwatering smells that would hit my nose and cause me to begin salivating when I stepped out of the shower, dressed down for the evening, and prepared myself for that special meal. 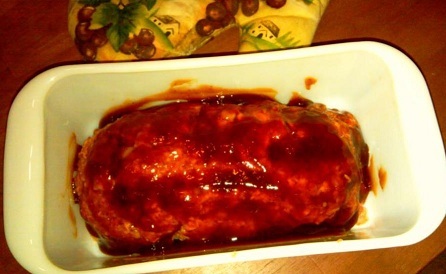 Meatloaf meant daddy, special occasions, and celebrations. It meant I'd earned straight A's that quarter and been allowed to request my favorite meal. It meant exciting and important company was coming for dinner. It meant mashed potatoes and peas on the side, two of my favorite things. This isn't my dad's memorable recipe; even he doesn't remember how he used to make it anymore. But I adore this recipe, and it is wonderfully similar to the one I enjoyed growing up. It's taken a couple of years, a few tweaks, and a few more adjustments to get it right, but I'm positive that this meatloaf will go down in my own children's memories as my father's did in mine. The best part -- it takes very little prep work and is a much healthier version of what I ate growing up. I hope it remains in your memories as it has in mine. And don't forget -- take a shower (or a bubble bath) while it's in the oven. I promise, the aroma when you step out of that steamy bathroom all relaxed and wound down will be better than any aromatherapy you've encountered thus far. Combine all ingredients EXCEPT BBQ sauce in a medium mixing bowl. Mix and Knead ingredients together until thoroughly combined. Coat loaf with the 1/4 cup of BBQ sauce. Loosely cover pan with tin foil. Slice into 8 slices (that's four 2-slice servings) and Enjoy! Who says nutritious home-cooked meals have to be tasteless or difficult? I'm a full-time professional with little time to waste in the kitchen. Let me share some of my simple, tasty, and healthy recipes with you and your family!